Brian Duncan has wanted to be a cop for as long as he could remember, but for the 73-year-old El Cajon resident, that wish has remained an unrequited dream. He is one of 15 cadets to be graduating Friday from Grossmont College’s 32nd Police Academy and he has his sights set next on joining the El Cajon Police Department as a reserve officer. 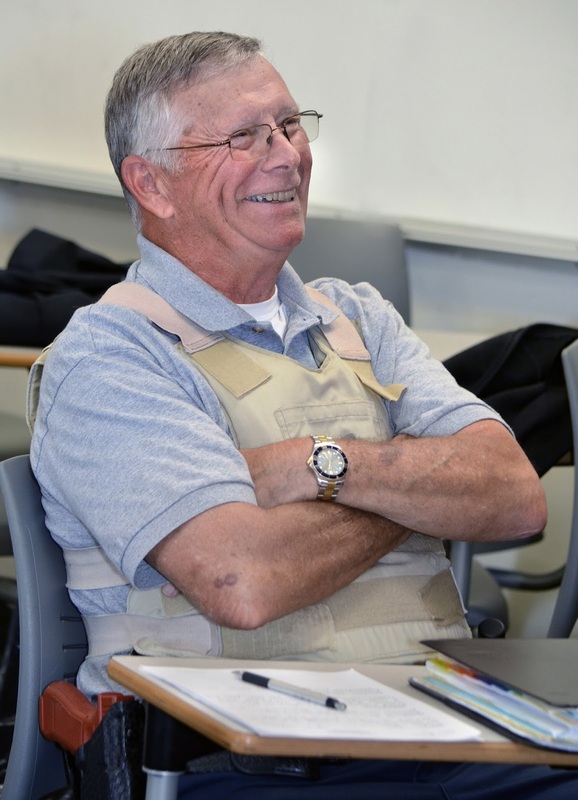 Military veterans, college students and others looking at their job options are invited to take part in the East County Economic Development Council’s annual Careers in Manufacturing Tour and Panel Series co-hosted by Cuyamaca College on Thursday, May 3. There is no cost for the event, but online registration is required beforehand. The event’s purpose is to introduce job seekers to opportunities in the manufacturing sector, and the tour will include visits to both Taylor Guitars and Computer Integrated Machining, Inc. Cuyamaca College will host a complementary lunch and an employers’ panel. Job-training resources will also be available. 7:30 to 8 a.m. – Check in at the East County Economic Development Council’s table in Student Lot 5 at Cuyamaca College, 900 Rancho San Diego Parkway in Rancho San Diego, 92019. 8:30 a.m. – Buses depart for tours at Taylor Guitars and Computer Integrated Machining, Inc. Noon to 1:30 p.m. – Complimentary lunch and a manufacturers’ panel at the Cuyamaca College Student Center. Hiring personnel from local manufacturers will be on hand to answer questions. Sponsoring the tour are Cuyamaca College, Bank of America, Comerica Bank, SDG&E, Silvergate Bank, US Bank and Wells Fargo. For additional information, contact Elizabeth Liddell of the East County Economic Development Council by calling (619) 258-3670, or by emailing Elizabeth.Liddell@eastcountyedc.org. 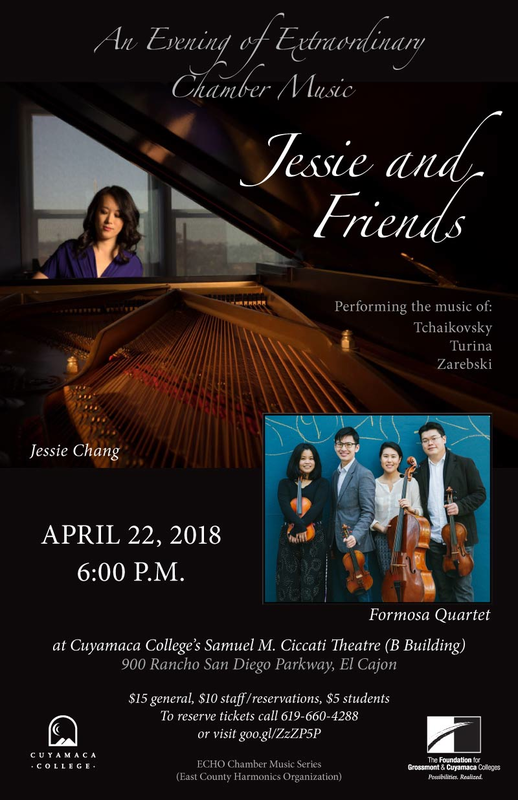 The Samuel M. Ciccati Theatre at Cuyamaca College will be imbued with the music of Tchaikovsky, Joaquin Turina and Juliusz Zarebski when pianist extraordinaire Jessie Chang and the internationally acclaimed Formosa Quartet perform in the penultimate concert of the inaugural East County Harmonics Organization (ECHO) Chamber Music Series on Sunday, April 22, at 6 p.m. The ECHO Chamber Music Series has been bringing world-class musicians to Cuyamaca College for the community to enjoy. This is the fourth of five ECHO concerts scheduled during the spring. 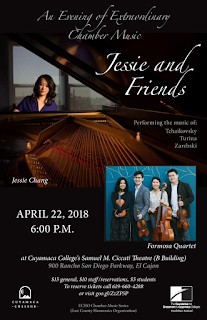 Jessie Chang has collaborated with major orchestras such as the San Diego Symphony, the Malaysian Philharmonic, the China Philharmonic, the Singapore Symphony Orchestra, among others. She also appeared at the Blossom Festival with The Cleveland Orchestra playing Mozart’s double concerto with her duo-partner and husband, Jahja Ling, the former music director and conductor at the San Diego Symphony. In addition, Chang has been featured at Carnegie Hall’s Isaac Stern Auditorium, Pasadena’s Ambassador Auditorium and at 92Y in New York. Winners of both the First Prize and Amadeus Prize at the London International String Quartet Competition, the Formosa Quartet has been described as among the best string quartets of its generation and has given critically acclaimed performances at the Ravinia Festival, the Library of Congress, the Da Camera Society of Los Angeles, the Chicago Cultural Center, and the Walter Reade Theater at Lincoln Center, among other venues. It has recorded on the EMI, New World Records, and Delos labels. Members include cellist Deborah Pae and violinists Jasmine Lin, Wayne Lee and Che-Yuen Chen. Admission is $5 for students, $10 for staff and for those who make advance reservations, and $15 for general admission seats. Tickets can be reserved online. The ECHO Chamber Music Series is underwritten by Sam Ersan, a vice chair at the San Diego Symphony’s Board of Directors who established the Sam B. Ersan Chamber Music Fund at UC San Diego and whose philanthropy includes founding two chamber music groups, the Camera Lucida piano quartet and the Myriad Trio. Cuyamaca College is at 900 Rancho San Diego Parkway in Rancho San Diego, 92019. For further information, call (619) 660-4288.
recognizing exemplary marketing, communications, design and public relations efforts. 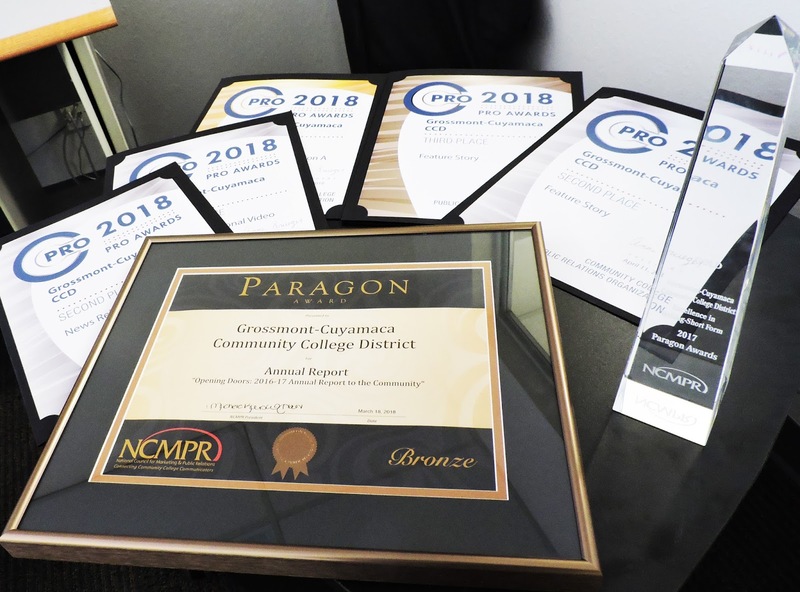 The district was honored Thursday with five PRO Awards from the Community College Public Relations Organization, a professional development and service organization that seeks to promote excellence in California's community college public relations and related professions. More than 350 entries were submitted from across the state. 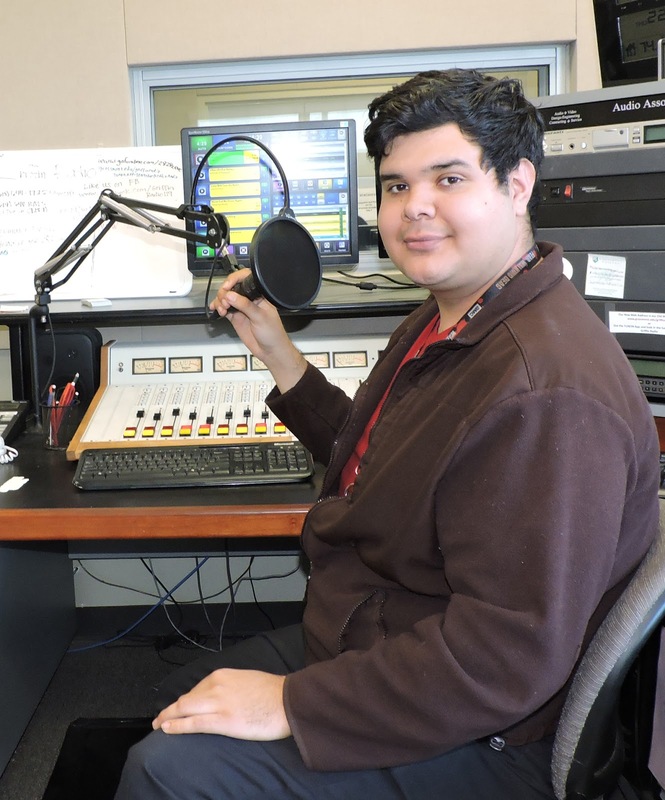 On Sunday, he picked up a first-place international broadcasting award in Las Vegas in the 2018 BEA Festival of Media Arts, billed as the world’s largest digital media and broadcast competition for students and faculty. 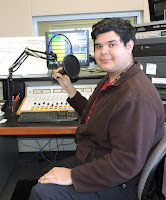 The Broadcast Education Association is an international professional association for instructors, students and industry professionals in electronic media and multimedia enterprises. Up to 5,000 visitors will converge on the Cuyamaca College campus when the annual Spring Garden and Butterfly Festival returns for its 25th year on Saturday, April 28, as the college, The Water Conservation Garden and the Heritage of the Americas Museum present an array of family-friendly events featuring plant sales, craft vendors, wine tasting and more. The Water Conservation Garden and the Heritage of the Americas Museum are housed at Cuyamaca College, and all three have scheduled a bevy of activities. 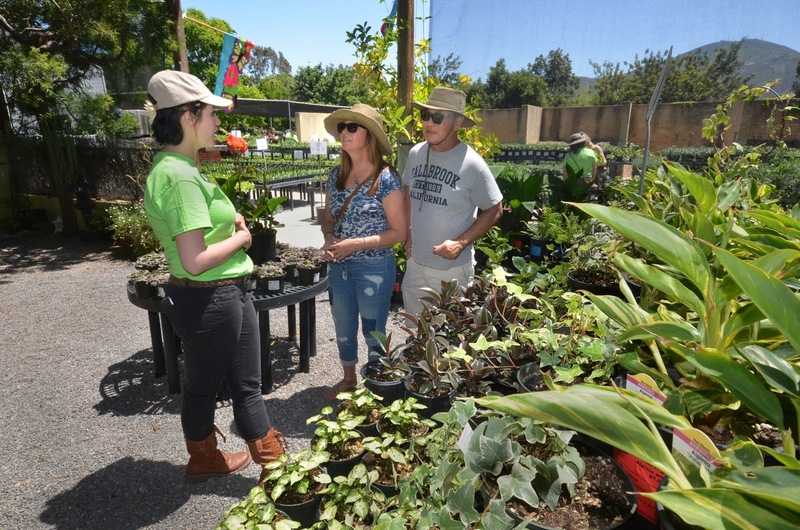 Cuyamaca College’s award-winning Ornamental Horticulture Department is hosting its biggest plant sale of the year, with proceeds supplementing the program’s operations. The Water Conservation Garden will be the site of butterfly releases, landscape consultations, a children’s story time with Ms. Metamorphosis, and a pollinator party with Ms. Smarty-Plants. The Heritage of the Americas Museum is presenting a Kumeyaay fire-making and artifacts demonstration, along with docent-led tours. More than 80 vendors, craftspeople and artisans will be on hand at Cuyamaca College’s Grand Lawn and in the Garden. The Grand Lawn will also house information booths and presentations from nearly two dozen Cuyamaca College academic and student programs. The Child Development Department, for example, is organizing activities for small children. Graphic design professors will discuss pathways to rewarding careers. And computer information systems instructors will detail how Cuyamaca College is putting people to work in high-demand fields such as cyber security. 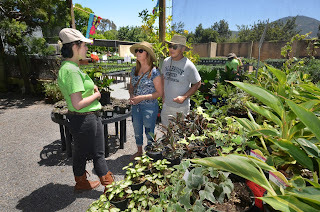 The popular event, one of the largest in San Diego’s East County, has its roots in the Spring Garden Festival launched 25 years ago by the Ornamental Horticulture program at Cuyamaca College. In 2017, it combined forces with the annual Butterfly Festival, which took flight after the Water Conservation Garden opened its Butterfly Pavilion in 2014. The military will be recruiting at the career expo. Polish your resume and practice your elevator speech. 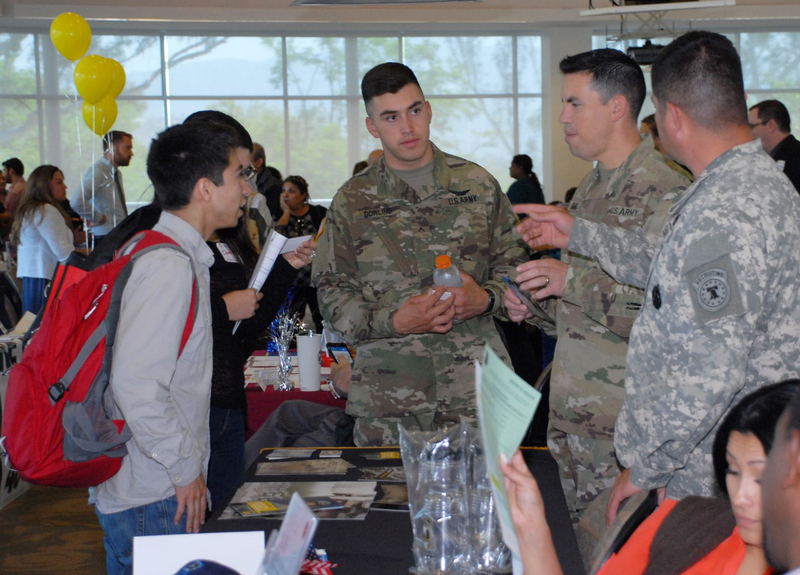 A record number of employers will be recruiting at the 26th annual East County Career Expo set for Wednesday, April 25, at Cuyamaca College. Free and open to the public, the expo is set for 9:30- a.m. to 1:30 p.m. and is expected to draw at least 65 businesses, companies and industries looking to hire. In past years, nearly 100 attendees have left with job offers and nearly that many job interviews have been lined up, thanks to the popular event. Sponsored by Cuyamaca College, America's Job Center of California and the East County Career Center, the expo will be held at the Student Center, Room I-207.